Nephi, for instance, discovered when he was still “exceedingly young” that the Lord would personally communicate with him (1 Nephi 2:6). In contrast to Laman and Lemuel’s murmurings, Nephi “did cry unto the Lord” because he had “great desires to know of the mysteries of God” (v. 16). In response to his asking in faith, Nephi said that the Lord “did visit me, and did soften my heart that I did believe all the words which had been spoken by my father” (v. 16). Importantly, Nephi’s early inclination to turn to the Lord for confirmation of sacred truths helped him to “not rebel against [his father] like unto [his] brothers” (v. 16). A similar contrast can be seen between Alma and Amulek and their opponent Zeezrom, who was a lawyer trained “in all the arts and cunning of the people” (Alma 10:15).3 Zeezrom tried to “question Amulek” in order to “make him cross his words, or contradict the words which he should speak” (v. 16). Yet even with all the learning and training of his people, Zeezrom was confounded by prophets of God, who miraculously “knew the thoughts and intents of his heart” (Alma 12:7). Recognizing the futility of his human wisdom and learning, Zeezrom eventually began to soften his heart and, like Nephi, “inquire … diligently, that he might know more concerning the kingdom of God” (Alma 12:8). Seeing this miraculous transformation, Alma explained if a man will not harden his heart, he will be “given the greater portion of the word, until it is given unto him to know the mysteries of God until he know them in full” (v. 10). This principle is well illustrated in the example of Lamoni’s father, who, like Zeezrom, started out contending against a prophetic messenger. He even tried to slay Ammon because of his prejudice against the Nephites (see Alma 20:10–20). But after discovering “the great love [Ammon] had for his son Lamoni” (v. 26), he was “desirous to learn” the spiritual truths that Ammon had taught his son (v. 27). 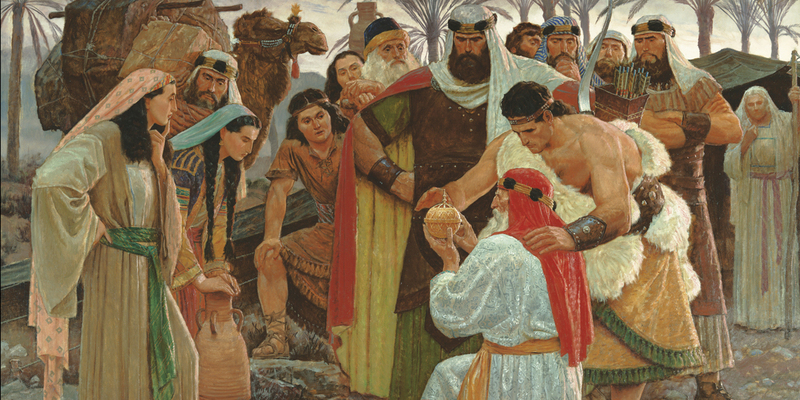 These and other Book of Mormon stories aptly demonstrate the foundational principles for receiving revelation.6 Not only does the Lord require that inquirers ask, seek, and knock (3 Nephi 14:7), but they must sincerely ask in faith, willingly seek in humility, and genuinely knock with real intent.7 Only in this condition—with a softened heart—can revelation flow into the minds and hearts of those who seek it. The reality of this truth is symbolized in many places in the Book of Mormon, as in the story of the Liahona. This miraculous device was given to Lehi and his family to help them journey through the wilderness and cross the ocean toward the promised land. Like the Holy Ghost, the Liahona’s main purpose was to simply “point the way they should go” (Alma 37:40). It didn’t tell them everything about what was ahead or how their journey would proceed, but instead prompted them to act on faith with only a limited amount of information. Yet, as Alma reported, because that miracle took place “by small means,” members of Lehi’s family sometimes became “slothful, and forgot to exercise their faith and diligence” (Alma 37:41). When this happened, the Liahona’s “marvelous works ceased,” the party “did not progress in their journey,” and they “were afflicted with hunger and thirst, because of their transgressions” (vv. 41–42).10 These hardships demonstrate the negative effects of forgetting or disregarding the revelatory power of the Holy Ghost. Elder Dallin H. Oaks, “In His Own Time, In His Own Way,” Ensign, August 2013, 22–27, online at lds.org. Elder Richard G. Scott, “How to Obtain Revelation and Inspiration for Your Personal Life,” Ensign, May 2012, 45–47, online at lds.org. Elder Richard G. Scott, “To Acquire Spiritual Guidance,” Ensign, November 2009, 6–9, online at lds.org. 1. See “Acquiring Spiritual Knowledge,” in Doctrinal Mastery: Core Document (Salt Lake City, UT: The Church of Jesus Christ of Latter-day Saints, 2016), online at lds.org. 2. For further insight into Mormon’s narrative goals, see Book of Mormon Central, “What Was Mormon’s Purpose in Writing the Book of Mormon? (Mormon 5:14),” KnoWhy 230 (November 14, 2016). 3. For more information concerning Zeezrom’s unrighteous approach to truth before his conversion, see Book of Mormon Central, “Why Would Zeezrom Attempt to Bribe Amulek? (Alma 11:22),” KnoWhy 118 (June 9, 2016). 4. See Book of Mormon Central, “What Did it Mean to be ‘King Over All the Land’? (Alma 20:8),” KnoWhy 128 (June 23, 2016) for further insights about Lamoni’s father and this pivotal altercation. 5. See Book of Mormon Central, “Why Does the Lord Speak to Men ‘According to Their Language’? (2 Nephi 31:3),” KnoWhy 258 (January 6, 2017). 6. For more examples, see Book of Mormon Central, “Why Must a Trial of Faith Precede a Witness of Spiritual Truth? (Ether 12:6),” KnoWhy 246 (December 6, 2016). For further insights about the revelatory message of the Book of Mormon, see Terryl L. Givens, “The Book of Mormon and Dialogic Revelation,” Journal of Book of Mormon Studies 10, no. 2 (2001): 16–27, 69–70; Elder Jeffrey R. Holland, “Conclusion and Charge,” in The Book of Mormon: First Nephi, The Doctrinal Foundation, ed. Monte S. Nyman and Charles D. Tate Jr. (Provo, UT: Religious Studies Center, Brigham Young University, 1988), 315–323. 7. See Book of Mormon Central, “How Will God Manifest the Truth of the Book of Mormon? (Moroni 10:4),” KnoWhy 254 (December 16, 2016). 8. Alma described this potentiality when giving his famous sermon on faith. He explained that the seed (the word of God) would only begin to grow within the heart “if ye do not cast it out by your unbelief, that ye will resist the Spirit of the Lord” (Alma 32:28). Jesus also warned of this possibility in the parable of the sower (see Matthew 13:19). 9. President Dieter F. Uchtdorf, “It Works Wonderfully!” Ensign, November 2015, 23, online at lds.org. 10. See Joseph Fielding McConkie and Robert L. Millet, Doctrinal Commentary on the Book of Mormon, 4 vols. (Salt Lake City, UT: Bookcraft, 1991), 3:282: “Thus the Liahona was a symbol of their faithfulness, a visible evidence of their standing before God.” Likewise, the companionship of the Holy Ghost—or the lack thereof—can be a meaningful indication of one’s standing before the Lord. 12. Elder Richard G. Scott, “He lives,” Ensign, November 1999, online at lds.org.